This 1 megapixel IP camera will give you much more clarity then a stand analog camera. 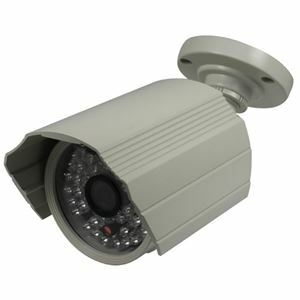 This 1 megapixel IP camera will give you much more clarity then a stand analog camera. Even at 700TVL you are only getting 960x480 resolution. This megapixel IP camera is capable of 1280×720. This is almost double the resolution! Get clearer pictures now and identify more with 1 Megapixel IP. This camera is also capable of recording 720p resolution at 30fps. 30fps is the fastest framerate for any IP camera. This IP Camera had built in PoE function. This means you can power the camera with a PoE Switch or PoE router. Installation will be much simpler because only one Ethernet wire is needed for installation. Power and data is transmitted between the PoE Switch/Router and the PoE IP Camera. This model offers a fixed focus 4mm Megapixel lens. 4mm will give you a 70 degree field of view for outside perimeter shots. This lens is also a Megapixel lens that was designed specifically for Megapixel Cameras. We use Megapixel lens in our cameras to make sure we are using the best parts available. A lens is only as good as it's main component, glass. This Megapixel camera is equipped with night-vision IR LED's. The IR LED project to a distance of about 90 feet, even allowing the camera to pick up images in complete darkness! This camera has a built in web-server. This websever is accessible from a PC using Internet Explorer. You can also use the included CMS software to view from PC. You may also download the free MEYE HD app from the Apple iTunes store or MEYE HD from the Android Google Play Store. You may use your iPhone, iPad, Android Phone or Android Tablet to view remotely.